AVALON — Avalon, now a flourishing and luxurious vacation destination, has a competitive hotel market with a resort option for almost everyone, whether you’re looking for history, spa lodgings, or something with a bit of nightlife. With the many options guests have to visit hotels, it is hard to imagine a time when hotels were nonexistent and the most common way of staying on the island during the late 1800s was by tent. For about $7.50 a week, which translates roughly to around $187 today, guests could stay in a tent that provided beds, bedding, basic furnishings and limited cooking facilities. During the summer around 80 to 100 tents would be rented and that number continued to climb into the next century. By the late 1800s, the Victorians of the time were clamoring to travel to exotic and adventurous destinations, making Catalina Island a thriving vacation spot as early as 1891. As time went on, Catalina Island looked to expand its visitation and to provide lodging that fit all visitor’s means, from those who had a tighter pocket book to those who wanted a more extravagant and pricier excursion. This resulted in Catalina’s Hotel Boom where multiple hotels began popping up creating competition between vendors on the island. 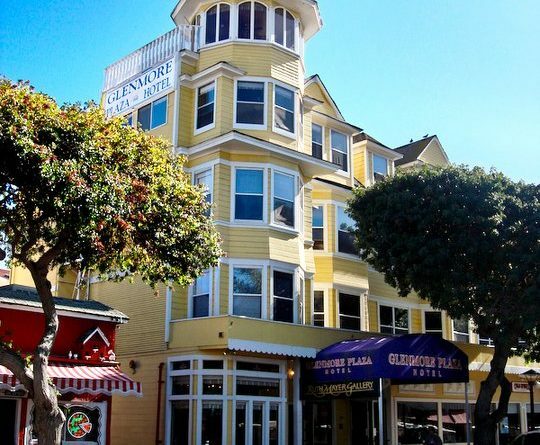 Constructed by the same crew that built the Hotel del Coronado in San Diego, Glenmore Plaza Hotel was built in 1891. It still stands on Summer Avenue, its original location. Over the years Glenmore Plaza Hotel has seen the likes of celebrities such as Charlie Chaplin, Clark Gable and Amelia Earhart stay there and it has even been rumored the hotel is haunted — if you believe in that kind of thing. In any event, Glenmore Plaza Hotel now holds bragging rights as the second oldest hotel built in California that is still operating and guests are welcome to book a stay to this day. This article references “The California Channel Islands” by Marla Daily and “Catalina Island” by Jeannine L. Pederson.